Occasionally, and that’s very occasionally, something comes along that works so well and is so simple that is should likely never be messed with for fear of ruining it. On that semi-prophetic note; let’s turn our collective gaze to the latest numerical blocky puzzler from Nintendo, Picross e6. The Picross series has been around since the days of the Gameboy and it manages to be both simple and frustratingly complex, in fact, the only substantial change that has hit the series was the shift to eShop only releases, beginning with the wonderful Picross e on Nintendo 3DS. As Picross as a franchise is completely without a narrative, the other aspects of the game come under greater scrutiny than my normal reviews (simply because I love a good story – biased I know). Luckily, in the gameplay area, Picross e6 does not disappoint. Going back to my opening statement, Nintendo have barely changed anything and that is an overwhelmingly positive thing in this instance. The player is still confronted with a series of grids and need to fill in squares corresponding to the numerical clues along the top and left-hand side to complete a picture. Every puzzle gives you an hour time limit to complete it, this may make it sound easy but every mistake you make causes an increasingly harsh time penalty to be applied. Putting it simply, if you rush into it, you will quite quickly fail. There are two new types of puzzle in Picross e6 that weren’t in the previous instalments that each ramp up the difficulty in interesting ways. The first is Mega Picross, which adds new multi-row or column numbers to the clues. This tells the player that there is a group of interconnected blocks to fill in across two rows or columns. With these Mega numbers and original numbers both needing to be adhered to, the threat of the time limit of standard Picross is even more threatening (I personally have made far more mistakes and failed more puzzles in Mega than standard). 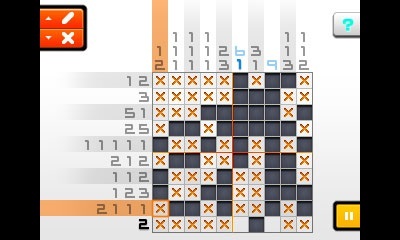 The second is Micross, which is a fun new take on the Picross formula. After completing an initial puzzle, the picture zooms in to a myriad of other puzzles. As you solve each of these puzzles, it slowly reveals a larger and more distinct picture than the puzzles in the other two modes. This is possibly the hardest mode on Picross e6 because some of the Micross puzzles are fiendishly difficult and there are a lot of them too. However, the aesthetic and pleasure pay off from completing one is far greater than the other two modes. Speaking of aesthetics, this game is not up to much. This being said, I do understand that there is only so much that can be done visually with a simplistic puzzler like Picross (and the Micross puzzles look pretty good when finished), so I don’t hold the visuals against the game at all. My gripe is with the music in the game, in that there isn’t really any. The game contains minimal tracks, and these cannot be rotated (unlike in Picross e), so for most of the game you will be hearing the same couple of songs on repeat. To remove the functionality that the original Picross e game had of changing the background music just feels like a step backwards. 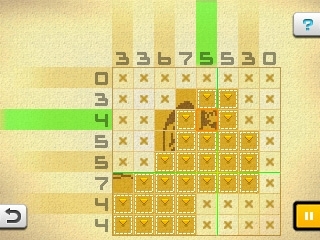 Okay, so should you buy Picross e6? If you are a fan of puzzle games, and have some sort of commute in your life, this game is most definitely for you. It’s a simple concept, with a steady difficulty curve and puzzles that you can hammer out when you’re on a roll with working out the numbers. Personally speaking here for a moment too, I physically could not put this game down, I got absorbed into the “one more puzzle” mentality with it and loved every moment (after I turned the sound off). So, will you be getting Picross e6 or do you already have it? Let me know in the comments or on Twitter (@reuthegamer).